For my event, I went to Edgewood College in Madison and saw an art show. The name of the art show was “Celebrating Friendship”. There were two artists that were being displayed. They were Orestes Larios Zaak and Gregorio Perez Escobar. Orestes was born on April 15 in 1953. He studied at the National School of Art in Havana, Cuba. He graduated from Instituo Superior Pedagogico, with a Masters Degree of Art. He is known for his use of nature. He tries to emphasize the honesty, kindness and integrity that nature offers to humanity. His work gives of a great sense of peace and calmness. On of my favorite works of art by Orestes was a painting called “Crepusculo” (Twilight). It was a blending of deep greens with small, white flowers and a few bees hovering them (Unfortunately I could not find a picture of it online). The pictures at the show were all related with each other in many ways. The main comparison was the focus of nature. 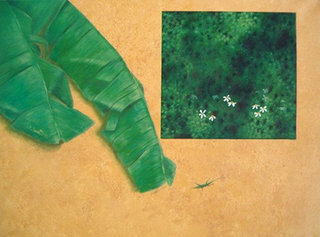 Some other similarities were grass, flowers (mainly white ones), bees, lizards and sand. Gregorio’s work focused on universal paradoxes. He, as well as Orestes, liked to tie nature into his work. That is one of his reasons for using wood. He says that it helps the spectator to relate his work to nature almost immediately. He also says that his ultimate goal is that humanity realizes their problems and fixes them. I have a few favorite pieces of art. 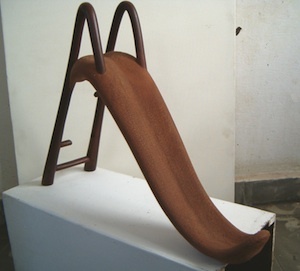 They are, “Communication” which is a children’s slide, but the slide is a person’s tongue and the ladder of the slide is broken and missing rungs, and “Gone” which is a pistol. I couldn’t find any personal information on Gregorio. Overall, I really enjoyed the art show. These two men are very talented. This relates to our class very well. We just got through the unit of art and learned how important it was to the Latin culture. Political topics are well like in the Latin art. Some say it is not art unless it shows a political view, but some don’t agree. These two artists didn’t show a political view at all. Instead they focused on nature and tried to bring in actions that humankind is doing to the world that aren’t necessarily right. They try to think critically and bring that into their art. Orestes was born in the 1950s. He studied many types of art in Cuba growing up. The main emphases in his paintings seem to be nature and the beauty and fragility it can portray. 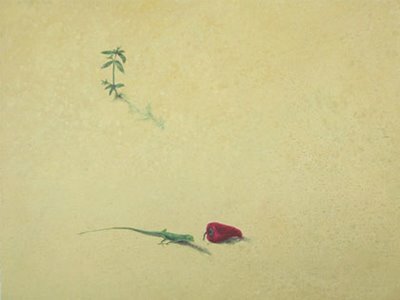 In his artwork, he has a way of taking the simplest elements: sand, grass, flowers, plants, etc., and turns them into a remarkable piece of art that you just cannot look away from. Gregorio, on the other hand, focuses his creative skills on developing some unusual artwork to say the least. Many of his works are wooden sculptures that seem to have a sense of illusion and mystery to them. 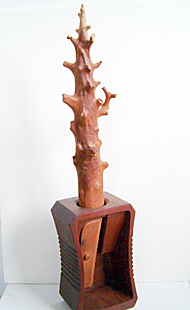 Cuban sculptures use wood as their mainstay because it’s abundantly available. This picture, in particular, is said to be described as a tree that is stuck in a pencil sharpener. All in all, the art show was very interesting to me. All of the different pieces made me think about what we had talked about in class. Wooden carvings and art in general was very important in the sustaining of the Latin culture. Although much of the art we talked about in class was argued about because it seemed to be political in nature. These two men didn’t show much, if any, political view with their art, but they did show how beautiful nature can be.